Update: my MAME arcade PC's motherboard died. I have an extra AMD FX-6100 cpu laying around and want use it to upgrade, slight upgrade, from the Phenom 4. I am looking for a AM3+ 95w motherboard. I am hoping to find one cheap here. I realized I really want to get rid of this stuff, so I'm adjusting the price of the lot to something more reasonable - FORGET pricecharting.com! First off the Game Gear is not working. It has NEW CAPS worked for two years and started to not turn on constantly. After 2 years it would take me 2-6 times turning it on and off for it to stay on. Now it barely turns on. According to pricecharting.com the lot of games is worth about $104 (I rounded the cents). I will sell the whole lot with the Game Gear and Magnifier shipped for [s]$110 $85 $65. - Individual game prices do not include shipping unless noted (most bundle prices include shipping). 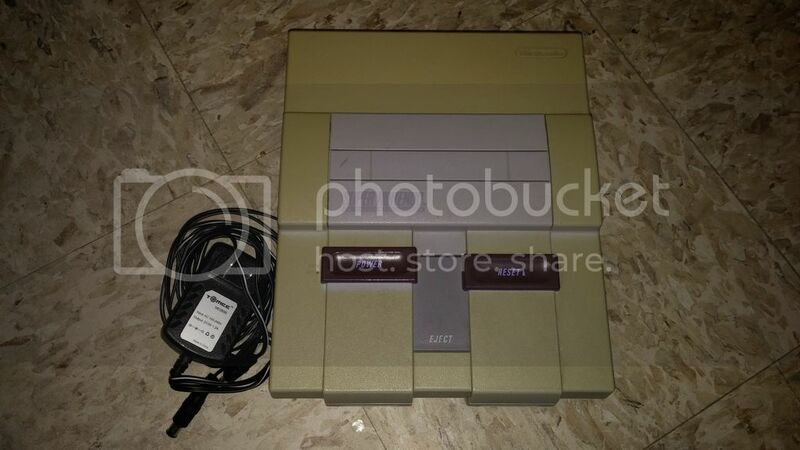 A Yellowed, but working SNES with a really yellowed High Frequency gamepad, off brand AC adapter and RF connector. These smell like an old basement and the reason is that they were stored in my Grandma's basement. All look work (but one) and look nice but have a hint of "basement" smell. Grand Prix (not working) - Cart, Box (opening flap ripped) - Free with 2 or more 2600 games. Saturn, PS1, Dreamcast, XBox, PS2, Gamecube, Nintendo DS, Wii, PSP, PS3 and WiiU. He offered a trade and I asked for a pic of the controller. Yup, thats about it. SpaceBooger wrote: He offered a trade and I asked for a pic of the controller. Yup, thats about it. Ah ok. Since that must have been in a PM, was a bit confused. While we're on the subject, see anything on my trade lists you'd consider for either of the Bust a Move? There are a few things on there pending. We all like the posts with the pumps and bumps!